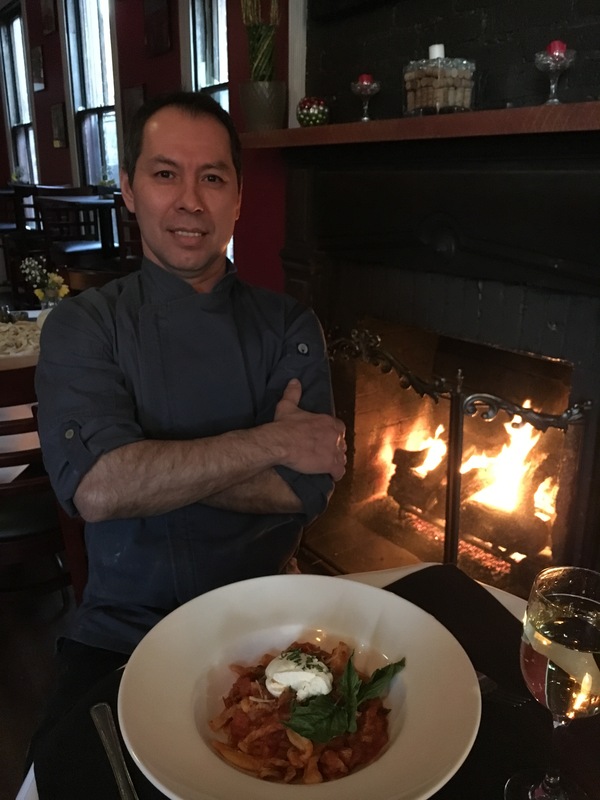 Chef Amador comes from a family of farmers who grew their own tomatoes and beans and also raised chickens. He has always been in touch with food. His family made tortillas and pasta growing up. When his family went on vacation, he would stay with his grandfather. In Honduras, men traditionally do not cook, but when he was alone with his grandfather, they stepped outside of the box and…cooked. As you can see from the bio, I learned how to cook from my grandfather. He taught me not only technique, but passion for the ingredients and the outcome of my dishes. I was taught that cooking was not a chore, but an experience. Other than the influence of my grandfather, I have no formal training. I started out as a dishwasher in 1995 at the then Trattoria de Franco (now La Trattoria) and worked my way up. My passion for the food, and the experience of working in kitchens my whole life is my inspiration. What dish on the menu reflects your personal style? Lasagna is my favorite dish on the menu and it is a dish my family would serve when a big group would get together. I make it from scratch with family secrets thrown in. Every dish is handmade to order. I personally make all of the pasta, pizza crust and bread. I have incorporated some new recipes from the owner – who has a passion for Italian food – in with mine. The menu at La Trattoria is mostly saute, so little preparation can be done in advance of when orders come in. Like most kitchens, it’s a whirlwind at busy times, and my role here is to make sure that every order makes it out of the kitchen in good shape. If any chef in the world (past or present) could prepare a meal for you, who would that be? Good Mexican food! I’ll take a good burrito bowl or fajita any day. If you would like to see your favorite Master of Cuisine featured in this space, send contact information to office@oldtowncrier.com.